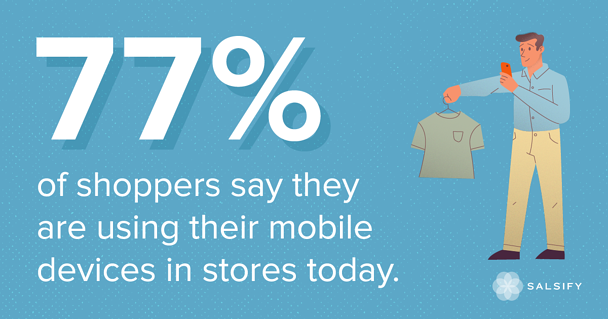 Takeaway: Not surprising that while shopping in-store, consumers will have questions about your products. The difference today is they want those answers immediately. In our newest consumer research, we’ve identified the questions brands must be prepared to answer while the consumer is standing in the aisle. 1. Is someone selling this product for less? 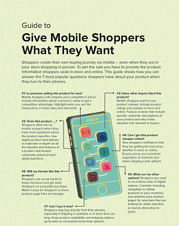 Price checking, one of the primary reasons 77% of shoppers use their mobile devices while physically in-stores, must be met with a clear and unambiguous response: Either you are offering the best price or you are not. Making consumers chase the lowest price with confusing offers will lead them to a competitor whose numbers are clean cut and upfront. 2. Have other buyers liked this product? Product reviews are rarely displayed in-store, so they must be easy to find on the site page. Position them front and center to minimize clicking around. Ensure the reviews are genuine, even if it means a handful of negative ones. 3. Does this product ….? Product descriptions are critical to research, and most consumers head online to check out more information, recognizing what’s there is often more complete than what’s on the product packaging. Play up this habit and ensure online product content is robust and easy to find. 4. Can I get this product cheaper online? With good reason, consumers have doubts about whether the channel they are browsing is offering the best value, often cross-referencing the shelf number with the one online. Ensure price consistency across all your diversified platforms and highlight this information with messaging. 5. Will my friends like this product? Social sharing and emailing to get opinions from spouses, kids, partners, friends, and housemates, goes beyond soliciting feedback on one’s Facebook feed. Sending an image or link by email, and more importantly text, should be accessible and not require hoops like logging into accounts or signing up for marketing materials. 6. What are my other options? Sometimes the consumer wants more variety than what’s physically in front of them, and you have to be okay with that. By showing the consumer endless digital aisles of like products merchandised by those most-searched, they’ll keep scrolling and clicking, ensuring they remain within your shopping experience. 7. Can I buy it now? Urgency is the key when the consumer is so close to the finish line. Shipping options and inventory details from an omnichannel perspective allow consumers to complete their journey on their own terms, even if they click ‘buy’ while still inside your store. We've created a helpful one-pager for you to think about how to address each one of these common shopper questions. Provide your email to download the guide.